The total dial surface measures 33mm, though not that big, the full DOT Matrix screen (56 x 32 dots [width x height]) can provide the time in numbers big enough to read across the room! Another neat feature is that the dial contrast can be manually adjusted, but if increased too high images tend to bleed. There is an infrared data transfer portal above the screen, yet another cool feature. 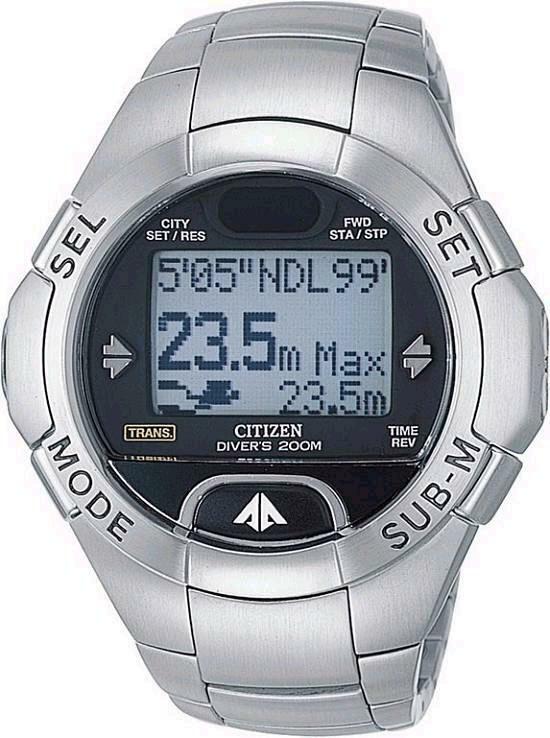 It allows 2 users to synchronize their watches (dive information / time). Too bad the dudes on the A-Team didn’t have these babies, they wouldn't have to manually synchronize their watches. I pity the fool! There was some speculation whether or not the crystal was sapphire on this watch, but CITIZEN USA answered my query. It is in fact mineral, too bad. It does however sit very low beneath the bezel, though this does not make it scratchproof, it does help avoid them. All in all, very readable, fun to look at and PLAY with. Similar to the SkyHawk, since it’s rechargeable you can play with this watch all you like, you do not have to worry about draining the battery.